This was the second time I have tried this very special wine: the first was at a tasting years ago that persuaded me that Sherry was no passing fancy. Since then I have learned a lot and tasted/drunk even more and it was fascinating to come back to this with that perspective and context. It is from Emilio Hidalgo, the family owned bodega responsible for some of my favourite wines and with a stunning range. Of all the sherries I have tried their epic old fino La Panesa would probably be the wine I couldn’t live without, while El Tresillo and El Tresillo 1874 are both absolutely outstanding. I am not even going to mention the 1860 Palo Cortado Privilegio due to shortage of superlatives. So this was one I have been looking forward to. It is a 100% pedro ximenez from fruit grown on Pago Añina. More importantly (in this case) it is from one of the foundational soleras – dating from 1861-and is a very very limited production wine that is bottled by hand in old school fashion. 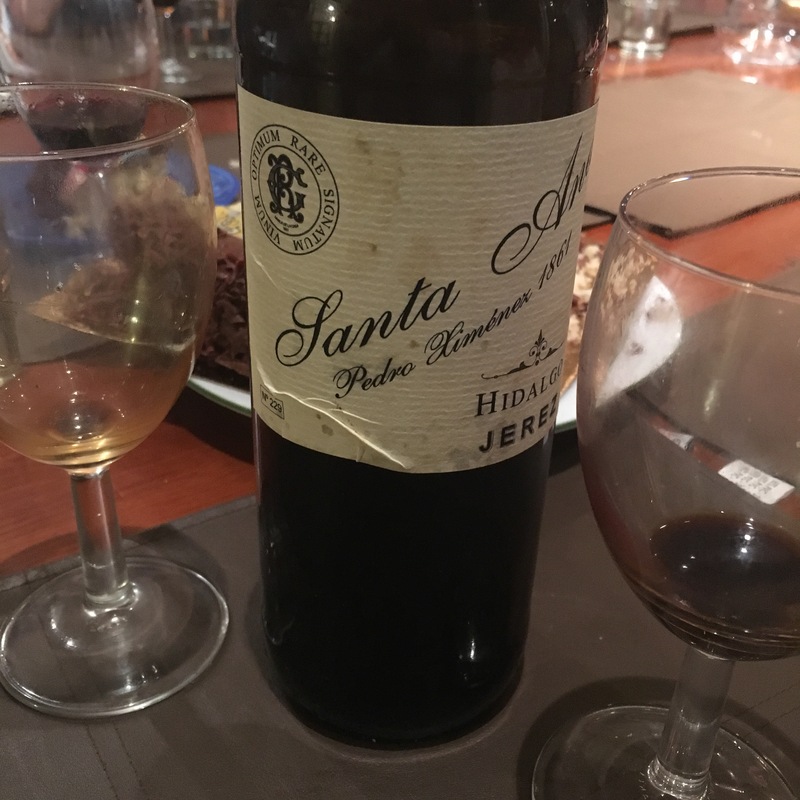 Needless to say it is, on average, many decades old (and, in sherry terms, quite costly, although I got this thanks to an offer at Vila Viniteca). It is nearly black in colour and very dense – coats the glass with black brown – but despite that great age and serious appearance it is remarkably fresh and youthful. As one of the (very good) friends I shared it with pointed out, it is complex – figs, nuts and caramel (someone said black treacle but I would say more caramel) – and it is immensely smooth and long. For the second time in a week I was surprised by the lack of concentration and acidity in such an old wine – I even hankered for the peppery spices of some very old PX – but this is wine from the soft fleshy inside of the raisin without the rind. Old and fresh, smooth and full of fruit, sweet but not syrupy – elegant class.